In an eight ounce glass or small bowl, add a third of the yogurt in an even layer. Add a third of the Honey Bunches of Oats® cereal. Then add a third of the blueberries. 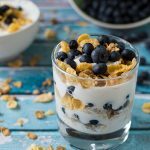 Alternate layers of the yogurt, cereal, and blueberries until there are three layers of each.